After wrapping up a terrible June that put them four games behind the Orioles in the AL East, the Red Sox were able to start July off on the right foot with a 5-4 win over the Los Angeles Angels at Fenway on Friday night. Steven Wright was on the mound for Boston and he came out looking like the ace he’s been all year. The knuckleballer had a shutout going into the sixth inning and was backed by some solid run support as the Sox were able to put five on the board by the fifth inning. They went up 1-0 in the first when Mookie Betts started the inning off with a double and later scored on a sacrifice ground out by Xander Bogaerts. In the fourth, Brock Holt started things off with a double and came around to score on a double by Travis Shaw. In the fifth inning, David Ortiz hit his 19th home run of the year and the 522nd of his career to make it a 3-0 game. The next batter was Jackie Bradley Jr. who singled to center, followed by Brock Holt who drove him in with his second double of the game. Two batters later, Holt scored on a single by Christian Vazquez to extend the lead to 5-0. The Sox scored all of their runs off the Angels’ starter Jhoulys Chacin and were able to chase him from the game. Unfortunately Steven Wright made one big mistake with the bases loaded in the sixth when he grooved one of his mid-80’s fastballs to C.J. Cron and it ended up in the monster seats for a grand slam, making it a one-run game. The Sox then turned to Matt Barnes out of the bullpen, who came in and retired the next three batters to end the inning. Right as the Angels grabbed their momentum, the game was delayed for an hour and a half due to rain. By the time they started things up again, the majority of the Fenway crowd had left the park. 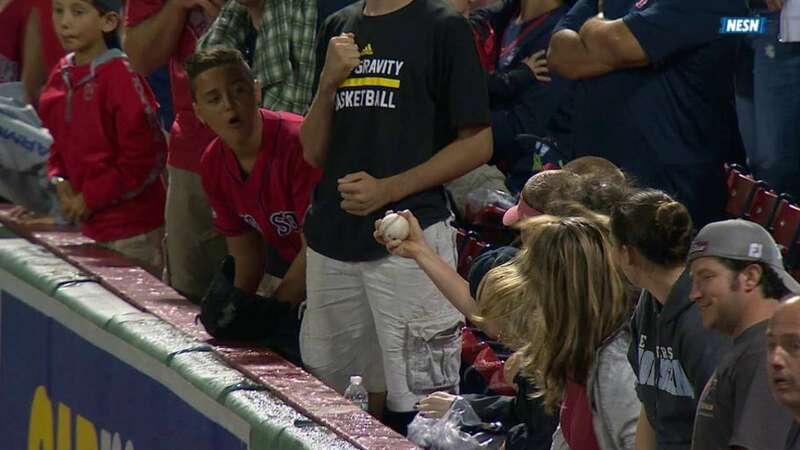 But it’s a good thing that one kid sitting near Pesky’s pole decided to stay and make the play of the game for the Red Sox. After Junichi Tazawa handled business in the seventh and Koji Uehara in the eighth, John Farrell called on his closer Craig Kimbrel to wrap up the 5-4 game in the ninth. That didn’t go so well at first. Kimbrel started the inning by walking Mike Trout. He then got Albert Pujols to fly out to center and Jefry Marte to pop out to second. The initial call was a ground-rule double, which would potentially save the Red Sox and Craig Kimbrel from blowing their one-run lead because Trout, who was on first, would be forced to stop at third. Of course Angels’ manager Mike Scioscia challenged that it was fan interference, in which case Trout would be granted home plate and we’d have a tie game. Everyone including the Red Sox announcers thought the call was going to be overturned, but after video review the umpires somehow decided that it was inconclusive and the play stood as a ground-rule double. With two outs and runners on second and third, Kimbrel got CJ Cron to ground out to third to end the game. A good team effort minus the one mistake from Steven Wright, but the player of the game goes to the kid who reached over the wall and bare-handed what should have been the game-tying hit by Daniel Nava. Safe to say the Sox caught a huge break in this one.